The following ins a 500 yd 270 Win ballistic trajectory and drop chart that follows a 130gr Winchester Silvertip with a ballistic coeddicient of .337 from the time it exits the muzzle until it hits the 500 yard mark. All data created using our free ballistic calculator. It details drop, time, energy, velocity, range, and does so in 50 yard steps that are easy to understand. 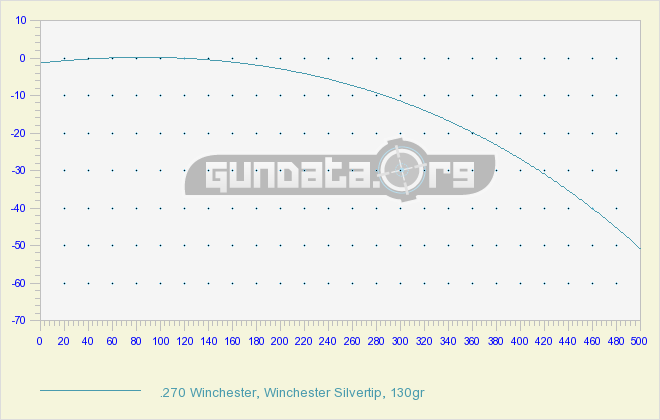 The 130gr Winchester Silvertip is a premium 270 win cartridge and is being fired at a velocity of 3060fps (about 200fps faster that it's parent case 30-06) from muzzle point blank, this also takes into account the standard 1.5" scope height, and a gun that has been sighted in at 100 yards. If your .270 Win isn't close to these specs, or if you are a sniper or just someone who is into long range shots you may want to take this a step further and use our ballistic calculator to create a custom 270 ballistic chart to take into account variances like atmospheric conditions and angles. The .270 win is an great short to long range medium to large game cartridge that can really benifit from a bit of trajectory calculation like we have provided. So what does the charting of the 270 Winchester's external ballistics tell us exactly? It tells me that bullet shoots pretty flat with just a 3.03" drop at 200 yards. Think about that in terms of football fields. 2 football fields are end to end. A deer at one end and you at the other. That bullet will only fall 3" when fired. Better yet at just 100 yards and with a 1.5" sited in at 100 yards the bullet will have dropped .0004 of an inch.